Experience Mendoza's highlights on this 5-day guided excursion from Buenos Aires. Taste the best varietals that Mendoza's winemaking regions of Maipu and Lujan de Cuyo have to offer. Visit the Christ the Redeemer statue and ascend Aconcagua, the highest point in both North and South America. Accommodation on a comfortable overnight bus and in a clean, friendly youth hostel are included, as well as some meals. Discover Mendoza, a dynamic urban center that enjoys a sun-drenched climate, views of the surrounding mountains, and world-class wine country nearby. Nearby landmarks include the natural stone bridge called Puente del Inca and the Christ the Redeemer Statue. Day 1: Meet your comfortable 'cama' or bed bus at Retiro bus terminal. Eat both dinner and breakfast on board, and sleep soundly in your plush seat in between. Gaze out the window at the passing Argentine pampas. Day 2: Arrive at the bus station in Mendoza, then transfer to the hostel. Check in to a four-bed room with private bathroom in a clean, friendly environment. Day 3: Visit Cordillera de Los Andes in this full-day adventure that leaves the hostel at 7:30am. Stop in the village of Uspallata and visit the Puente del Inca, a naturally-formed stone bridge at an ancient Incan ruin site. 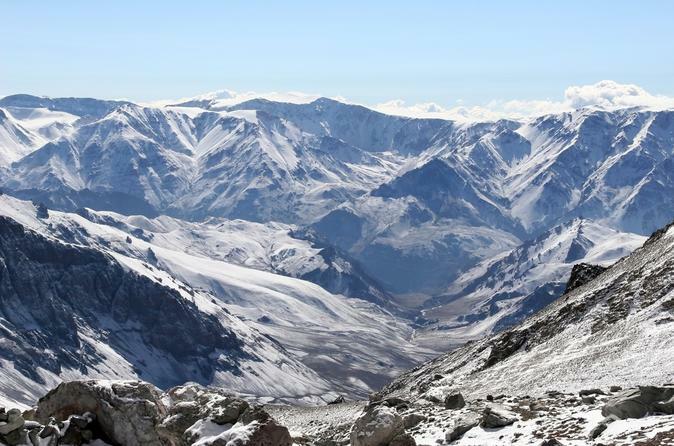 View Aconcagua, the Western Hemisphere's highest peak. Day 4: Spend the morning visiting wineries in Lujan de Cuyo and Maipu. In the afternoon, arrive at the station in Mendoza to board your overnight bus back to Buenos Aires. Enjoy dinner, a full night's rest, and breakfast on the bus. Day 5: Arrive in Buenos Aires.